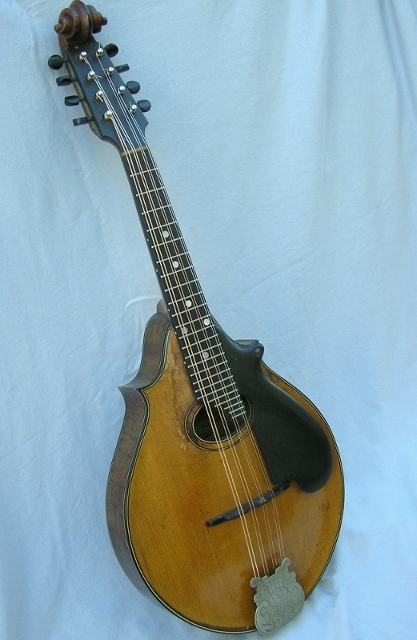 In the early part of the 20th century from 1917 to around 1935 the Lyon and Healy Company, based in Chicago USA, made a series of unique arch top mandolins. The early examples bore the Lyon and Healy name but later some time in the 1920's a few changes were made and the brand name was changed to Washburn. The scale length was also reduced to 13in from 13 & 3/4in on the type A, and the body points were made asymmetric. At the time Gibson was the dominant maker of mandolins and thousands were churned out by the Gibson Company. 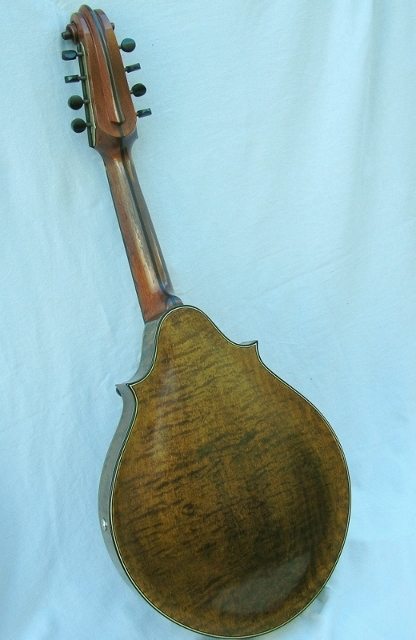 Lyon and Healy/Washburn on the other hand made smaller numbers of arch top mandolins, as well as bowl back mandolins. Their arch top mandolins came in 3 models, the A style, B style and C style. The A style was the top of the line, beautifully made with a scroll headstock and all models had a patented design engraved tailpiece. Well preserved specimens are much sought after nowadays. These mandolins are popular amongst classical music players because they have a sweet delicate sound, and due to the low neck angle and unique designed pick guard are delightful instruments to play. I have wanted to make a mandolin based on the Lyon and Healy/Washburn mandolins after coming across a few in the USA in 1999, but was never able to because I did not have an original to refer to. The construction of these mandolin was very different from the Gibsons of the same period, and many of the differences can only be appreciated by closely examining an original. They are built much lighter, and sound different. They also make extensive use of vulcanised fibre which Gibson never used. The pick guard, neck reinforcement, tuning knobs, and headstock overlay are all made from vulcanised fibre (not vulcanised rubber as is often stated). The impression I get from closely examining the originals is that the Gibsons were designed to be easy to build in mass production, whereas the Lyon and Healy mandolins were designed more to show off the Luther's skills, and show them off they certainly did particularly with the A style. The original Lyon and Healy mandolins are around 4mm thick in the centre of the top, but my Gibson A1 mandolin, which was made around the same time, is around 6mm thick in the centre. This is a huge difference. The Lyon and Healy's have a lower neck angle which reduced the bridge height by about 5mm from the Gibsons. The body size is also smaller than the Gibsons, and the arch height is higher. This combination allowed the mandolins to be built lighter but still to be stable, and it is rare for a top to collapse. I have seen modifications such as Banjo frets, higher neck angle and removal of the pick guard done to these instruments, but the people who do these modifications really do not understand what these mandolins are all about. The low neck angle and the pick guard are an essential part of the playability of the instrument. 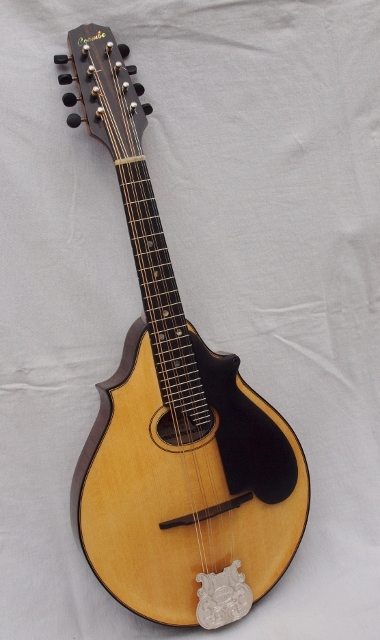 There are also quite a few mandolin makers who make a mandolin claimed to be "based on" or "influenced by" Lyon and Healy, but in fact they are actually based on Gibson construction principles and about the only thing they have in common with the Lyon and Healey mandolins is the body shape. The mandolin described here is actually based on an original Lyon and Healey and has very little in common with my standard model mandolin which was originally based on my 1918 Gibson A1. It has a smaller body with two points, higher arch with a more pronounced recurve, thinner carved top and back, lower neck angle of 2.75deg, lower bridge height and engraved tailpiece cover. 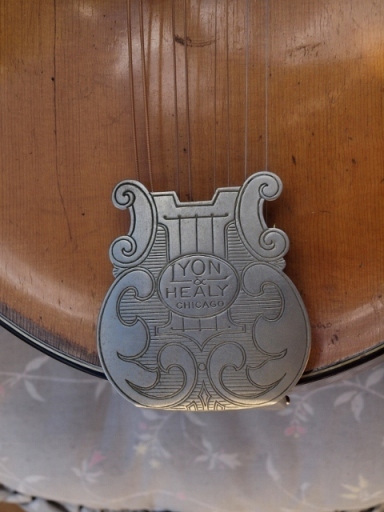 In May 2012 I imported an original style A Lyon and Healey mandolin, made in 1918, into Australia and have been examining this instrument very closely. The new mandolin described here is the culmination of this work. Here are some pictures of the original. It is somewhat beat up, and has a few issues, like most instruments more than 90 years old, but still sounds great. 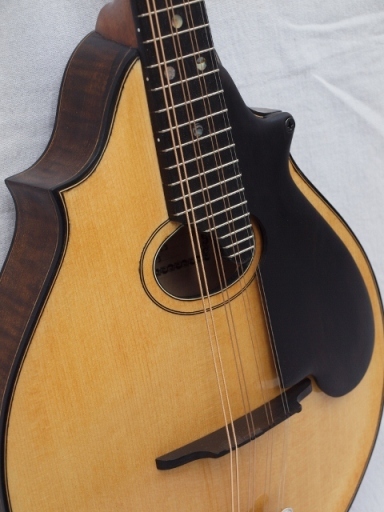 It was tempting to make an exact copy of the original, but the time and expense involved in accurately reproducing everything would have strained my bank account and made the mandolin so expensive very few people would be able to afford to buy one. So, a few difficult decisions had to be made in order to reduce the costs. 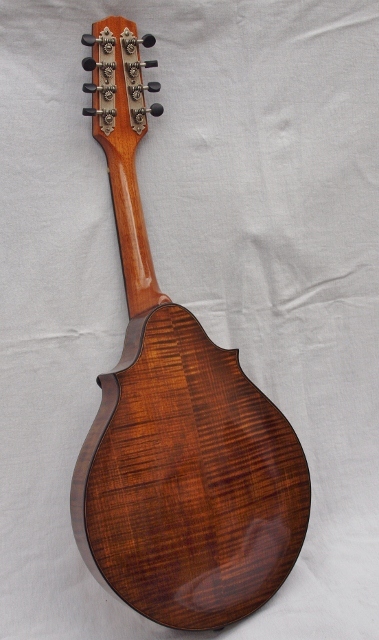 The Lyon and Healy mandolins are popular particularly amongst the classical music players because of their unique sound and playability, so any thing that influences sound and playability needed to be preserved and if possible improved upon. Thus the body size and shape, arching, graduations, neck angle and pick guard are the same as the original. The neck has a carbon fibre rod as reinforcement instead of vulcanised fibre so the big fat neck that is on the original was slimmed down a bit to make it more comfortable to play. The fingerboard is radiused instead of flat. The originals were finished with an oil based varnish and then french polished and that has been retained, although nobody knows exactly what oil varnish was used. 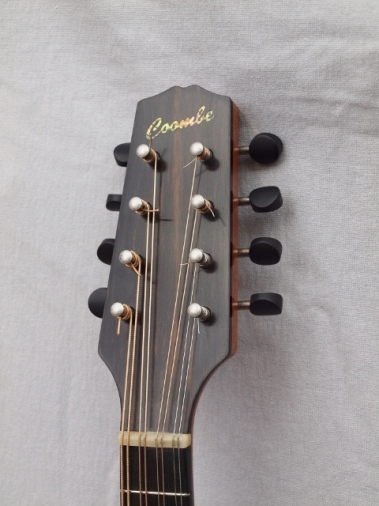 Modern tuners will not fit the scroll headstock, so the headstock had to be simplified to save costs on custom tuners and the labour of carving the complicated scroll headstock. Likewise the tailpiece was also simplified. 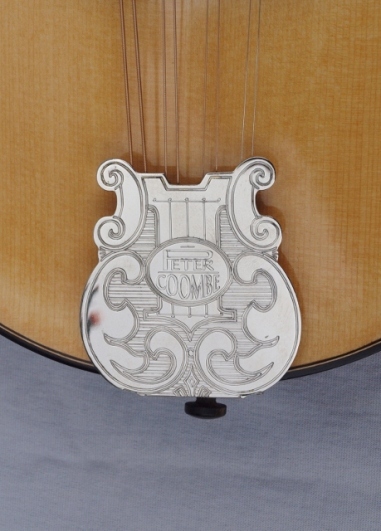 The tailpiece is a Gibson style of tailpiece, but with a custom engraved cover that was made by an Australian silversmith. Thus unlike the original, this mandolin does have an end pin so a strap can be used. The originals have no end pin, but have a retractable leg pin that is used to stabilise the instrument while sitting. Since the new mandolin does have an end pin, the leg pin is not necessary thus saving the cost of manufacturing a leg pin. The pick guard is carved from Ebony and finished with Danish oil. Bindings are Ebony with wooden purphlings. At one stage I thought I must be a masochist choosing Ebony and wooden purphlings, but I really like the end result so the extra effort was well worthwhile. The top is X braced because I have always preferred the cleaner sound I get with X bracing, and that has been born out in practice because this mandolin does have a slightly cleaner sound than the original Lyon and Healy. As far as the woods are concerned, nobody really knows what species of Spruce was used in the originals. It is unlikely to be Sitka or Engelmann Spruce because these species were not being used commercially in music instruments at the time they were manufactured. That leaves Red Spruce or European Spruce, but my guess is European Spruce because the originals do not have a big dynamic range which is characteristic of Red Spruce. Anyway, I chose Carpathian Spruce, which is a variety of European Spruce for the top. 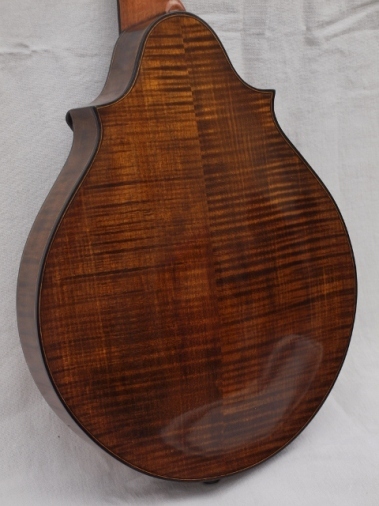 The original mandolins used figured Rock Maple for the back and sides, but I have chosen figured European Maple because I believe I get better results from European Maple in my mandolins and it is easy to get from violin wood suppliers. The neck was made from Mahogany in the originals, what species I don't know, but I have used some Brazilian Mahogany that is at least 25 years old. Over all I am extremely pleased with the final result, the looks, the playability and also the sound. The sound has the sweet and delicate sound of the original, but is significantly more lively and responsive, richer, and has more ring and sustain. Both I and my partner prefer the sound of the new instrument, it is just as easy to play like the original, so I think the project has been a great success.